An elderly lady once left $20,000 and “my Bible and all it contains” to her nephew. The young man knew what the Bible contained, so he didn’t bother to open it. He merely picked it up and put it on a high shelf in his house, and headed for Las Vegas. It wasn’t long until all his money was gone. He lived the next 60 years as a pauper, scraping for every meal and barely having clothes on his back. As he was moving to a convalescent home, he reached up to grab the old Bible and accidentally dropped it from his trembling hands. It fell to the floor and opened, revealing a $100 bill between every page. That man lived his life as a pauper when he could have lived in luxury, simply because of his prejudice. He thought he knew what the Bible contained. 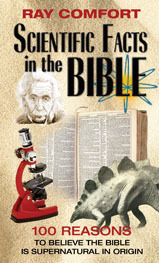 Most people don’t know that the Bible contains a wealth of incredible scientific, medical and prophetic facts. The implications are mind-boggling . . .